Pancreatic cancer will typically refer to ductal carcinoma of the pancreas, which comprises up to 90% of primary pancreatic malignancies. The remaining number can be divided into exocrine tumours (such as pancreatic cystic carcinoma) and endocrine tumours (derived from islet cells of the pancreas). Carcinoma of the pancreas is the 10th most common cancer in the UK, yet its high mortality rate makes it is the 4th most common cause of cancer death. It is rare under 40 years of age, with 80% of cases occurring between 60-80yrs. It is rarely diagnosed early enough for curative treatment. In this article, we shall look at the risk factors, investigations and management of a patient with pancreatic cancer. The most common type of pancreatic cancer is ductal carcinoma (90% of primary pancreatic malignancies). Other rarer forms include cystic tumours, ampullary cell tumours and islet cell tumours, which all often have a much better prognosis. As the cancer spreads, direct invasion of local structures typically involves the spleen, transverse colon, and adrenal glands. Lymphatic metastasis typically involves regional lymph nodes, liver, lungs, and peritoneum. Metastasis is common at the time of diagnosis. Figure 1 – Pancreatic cancer can spread directly to surrounding structures, such as the spleen, transverse colon and adrenal gland. There are few clear risk factors for the development of carcinoma of the pancreas. Those that have been identified include smoking, chronic pancreatitis, and recent onset of diabetes mellitus. There may also be a hereditary element, as 7% of patients have a family history of the disease. Late onset diabetes is an additional risk factor. Those diagnosed with diabetes after 50 years of age have an 8 times greater risk of developing pancreatic carcinoma in the following three years than the general population. Approximately 80% of cases of pancreatic carcinoma are unresectable at diagnosis, testament to the late and often vague and non-specific nature of its presentation. Less common presentations include acute pancreatitis and thrombophlebitis migrans (a recurrent migratory superficial thrombophlebitis, caused by a paraneoplastic hypercoagulable state). Tumours of the tail of the pancreas have an insidious course and not generally symptomatic until a late stage. Courvoisier’s law states that in the presence of jaundice and an enlarged/palpable gallbladder*, malignancy of the biliary tree or pancreas should be strongly suspected as the cause is unlikely to be gallstones. This sign may be present if the obstructing tumour is distal to the cystic duct. In reality an enlarged gallbladder is present in less than 25% of patients with pancreatic cancer. Any suspected pancreatic cancer should warrant initial blood tests, such as FBC (anaemia or thrombocytopenia) and LFTs (raised bilirubin, alkaline phosphatase, and gamma-GT, showing a obstructive jaundice picture). CA19-9 is a tumour marker with a high sensitivity and specificity for pancreatic cancer, yet its role is in assessing response to treatment rather than for initial diagnosis. The initial imaging for pancreatic cancer is commonly an abdominal ultrasound, which may demonstrate a pancreatic mass or a dilated biliary tree (as well as potential hepatic metastases and ascites if very late stage disease). Endoscopic ultrasound (EUS) may be subsequently be used to guide fine needle aspiration biopsy in order to histologically evaluate the lesion, if the diagnosis is still unclear. ERCP can also be used to access the lesion for biopsy or cytology, if in a suitable location*. *A biliary brushing for cytology if ERCP is being used to relieve the biliary obstruction and there is no tissue diagnosis. Absolute contraindications for surgery include peritoneal, liver and distant metastases. Morbidity following the procedure is high (up to 40%) and specific complications include formation of a pancreatic fistula (due to leakage of pancreatic juices from the incised margin of the pancreas), delayed gastric emptying, and pancreatic insufficiency. A Cochrane review found that pancreatic resection increases survival and reduces costs compared to palliative treatments in patients with locally advanced pancreatic cancer and venous involvement., assuming there is sufficient clinical expertise available. A Whipple’s procedure involves the removal of the head of the pancreas, the antrum of the stomach, the 1st and 2nd parts of the duodenum, the common bile duct, and the gallbladder. All viscera removed in the operation are done so due to their common arterial supply (the gastroduodenal artery), shared by the head of the pancreas and the duodenum. 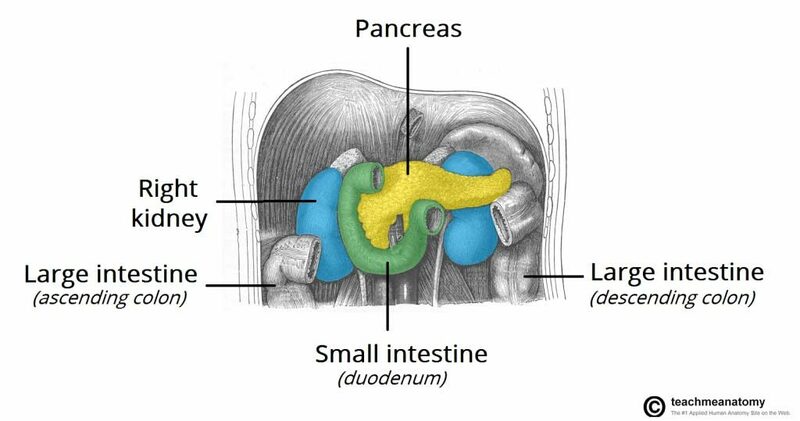 Following this, the tail of the pancreas and the hepatic duct are attached to the jejunum, allowing bile and pancreatic juices to drain into the gut, whilst the stomach is subsequently anastomosed with the jejunum allowing for the passage of food. Adjuvant chemotherapy, generally with 5-flourouracil, is recommended after surgery as it has been demonstrated to improve survival following the ESPAC-1 trial*. *ESPAC-1 also demonstrated patients treated with adjuvant chemoradiotherapy had worse outcomes overall than those treated with adjuvant chemotherapy alone. In metastatic disease the use of FOLFIRINOX regime (folinic acid, 5-fluorouracil, irinotecan, and oxaliplatin) is advised in those with a good performence status, however has yielded only modest improvements in survival; gemcitabine therapy can be considered for people with locally advanced pancreatic cancer who are not well enough to tolerate FOLFIRINOX. The majority of patients with pancreatic cancer are not candidates for curative surgery, but instead require palliative care. Obstructive jaundice and associated pruritis can be relieved with the insertion of a biliary stent, via ERCP or percutaneously. There is also a role for palliative chemotherapy, with NICE currently suggests a gemcitabine-based regime in patients with a reasonable performance status. Exocrine insufficiency is common in advanced disease or those who have had significant excision of the pancreas and can lead to malabsorption and steatorrhoea. This can initially be treated with enzyme replacements (including lipases), such as Creon®, which are typically administered with meals. A recent study showed for those patients undergoing pancreatoduodenectomy for pancreatic cancer, the use of pancreatic enzyme replacement therapy was associated with an improved survival. Pancreatic cancer has a high metastatic capacity even in small tumours. The prognosis in pancreatic cancer remains dismal, with overall 5-year survival rate is less than 5%. One study showed the prognostic impact of tumour size is restricted only to patients with localised disease. Endocrine tumours of the pancreas may be functional or non-functional. Functional tumours actively secrete hormones and their signs and symptoms are related to this, whilst non-functional tumours do not secrete active hormones and clinical features are related purely to their malignant spread. Endocrine tumours of the pancreas are often associated with multiple endocrine neoplasia 1 syndrome (MEN1), also known as Wermer’s syndrome. MEN1 typically consists of hyperparathyroidism, endocrine pancreatic tumours, and pituitary tumours (most commonly prolactinomas). Table 1 – Endocrine tumours of the pancreas. All cases should be discussed at a multi-disciplinary team meeting in a tertiary hospital where management can be guided. 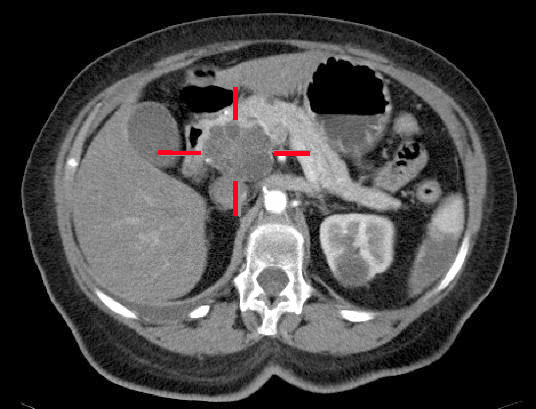 Pancreatic NETs are best investigated with a combination of CT, MRI, and / or EUS. Intra-arterial calcium with digital subtraction angiography can also be used in the localisation and assessment of insulinomas and gastrinomas. Small non-functional well differentiated pancreatic NETs (<1cm) can simply be observed, Larger or functioning tumours are resected, with any distant metastatic disease also resected if the tumour is low grade and the metastases is low volume. Somatostatin analogues can be used to control and ameliorate the effects of hormonal hypersecretion (even in the case of somatostatinomas). Which one of the following factors does not increase the risk of developing pancreatic cancer? In which of the following scenarios is the Courvoisier's sign most likely to be positive? In a Whipple's procedure, which viscera is not removed routinely as part of the operation? What hormone is released in excess in Zollinger-Ellison syndrome? Which genetic syndrome is associated with neuroendocrine functional tumours of the pancreas? Which imaging is the gold-standard for visualising an insulinoma?